This is one of the easiest Kerala Fish Curries I make since it doesn’t involve any roasting or grinding or shredding coconut. 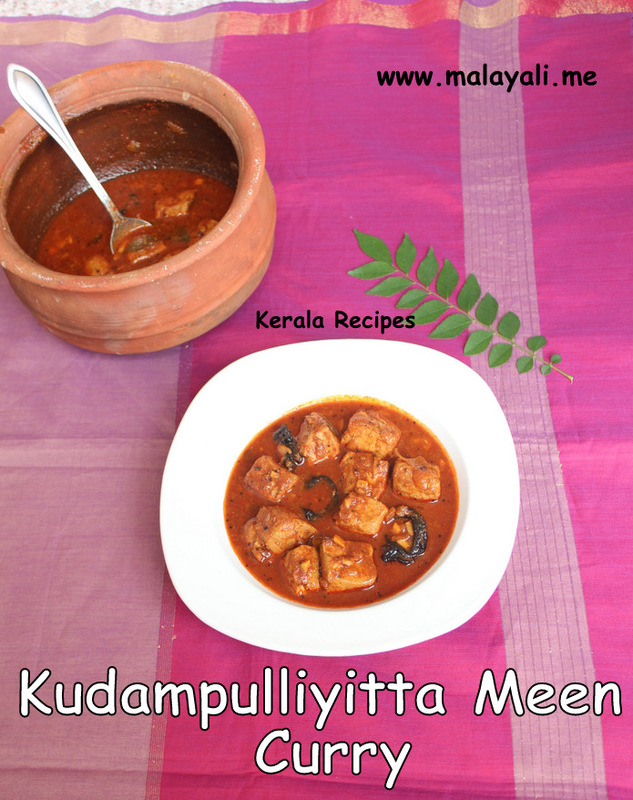 Kudampulli (Fish Tamarind/Gambooge) is mostly used as the souring agent in Kottayam Style Fish Curries. My mom and mother-in-law always make Fish Curry with Kudampulli except for the occasional Fish Molee. I had some frozen Seer Fish (Ney Meen) and decided to make a quick curry. The frozen ones of course lack the flavor of the fresh Ney Meen which was used regularly for Fish Curry at our house back in Kerala. I try making Fish Curry in a Manchatti (Claypot) whenever possible because that is how it is made in Kerala. Kudampulliyitta Meen Curry goes well with Rice and Kappa (Tapioca/Yuca). This Meen Curry is lot more healthier than Kerala Fried Fish and other Fish Curries made with Coconut paste or milk. You need to use Kashmiri Chilly or Paprika powder to get a nice red color for the gravy without all the extra heat. Wash and clean the fish fillets. Add a pinch of turmeric powder and 1 tbsp lemon juice to water and soak the fish fillets for 5 minutes. Drain and keep aside. Prepare a marinade using the above ingredients and rub it on the fish. Meanwhile peel the shallots and slice it into small round pieces. Soak the tamarind pieces in a cup of warm water. Alternatively, you can microwave it for a minute so that is softens. Heat 2 tbsp oil in a deep pan or manchatti and splutter mustard seeds. Add the shallots and saute for a while so that it turns translucent. Add curry leaves, ginger and garlic. Saute for a few minutes. Make a paste using kashmiri chilly powder, fish masala powder and coriander powder adding very little water. Reduce heat and add the paste. Stir for 3-4 minutes until the raw smell disappears. Sprinkle 1/4 tsp fenugreek powder and saute for a few more minutes. Add the fish tamarind (kudam puli) pieces along with the tamarind water. Add 1 more cup of water and salt to taste. Increase heat and bring the gravy to a boil. Reduce heat to medium and add the fish fillets along with marinade if any. Cook uncovered for 12-15 minutes swirling the pan occasionally. Switch off the stove and cover the pan. 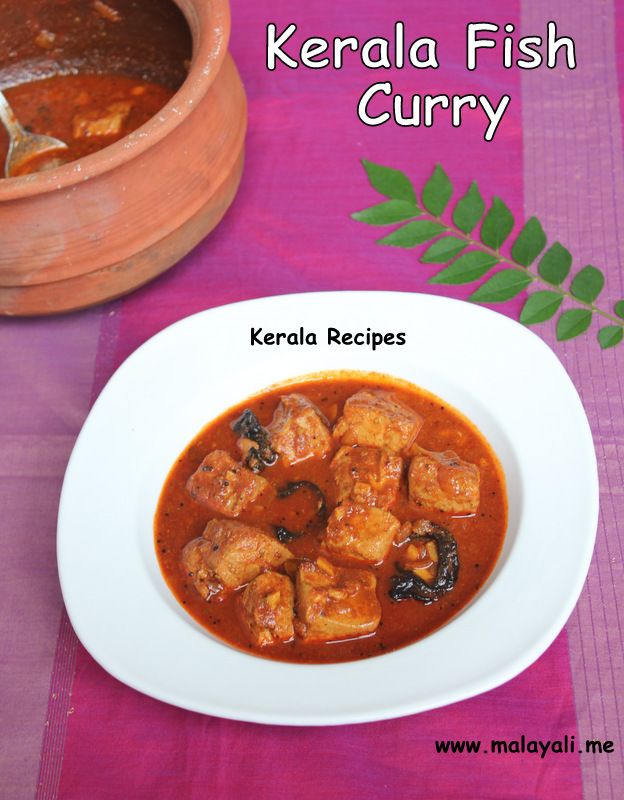 Keep this fish curry for atleast 4-5 hours before serving, so that the fish absorbs all the flavors. You can remove a few pieces of kudampuli if you find the gravy to be very sour. If you don’t have Fish Masala powder, replace 1 tbsp of Fish Masala Powder with 1 tsp Red Chilly Powder, 1 tsp Kashmiri Chilly Powder and 1 tsp of Coriander Powder. kokum and kodum pulli are two distinct fruits(?). Thanks for the useful information. 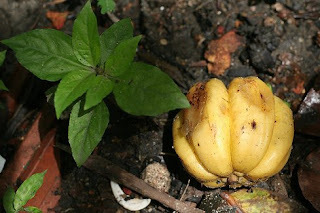 Many sites have confusingly mentioned Kudampuli as Kokum but now I have got the correct term. I have made the necessary changes to my posts. Yes this fish curry has a water based gravy. Moreover, there are no ground ingredients to give thickness to the gravy. This is the recipe for Meen Chaaru Curry. Whereas, Meen Pattichathu (haven’t posted the recipe yet) which is traditionally made in a Chatti has less gravy. However, you can reduce the amount of water used and boil it for a longer time to thicken the gravy.